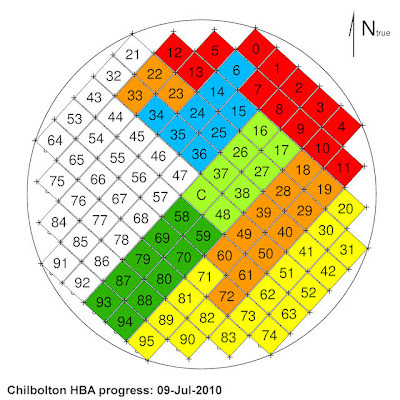 Here is the new completion map for the LOFAR-Chilbolton HBA antenna installation. Today's progress is marked in light blue. Today was an extremely hot day. Working with 5x5m black boxes in the direct sunshine was very uncomfortable for the Chilbolton crew. Still, good progress was made. 71 out of 97 now complete.